This study, conducted through CXL Institute, is the first of a two-part series exploring security perceptions on checkout pages. 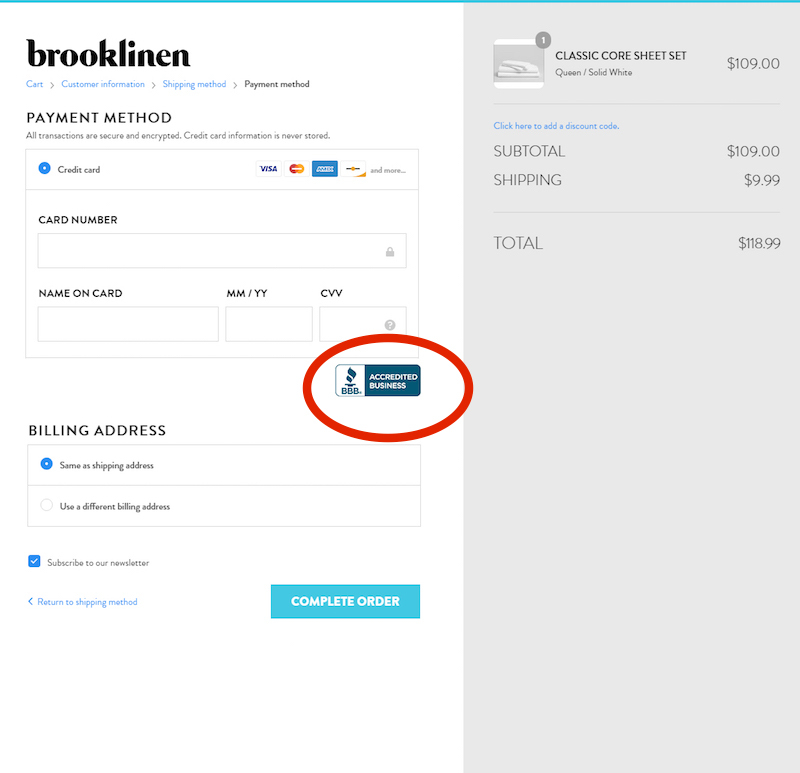 We compare the effectiveness of six popular trust badges on an actual checkout page. 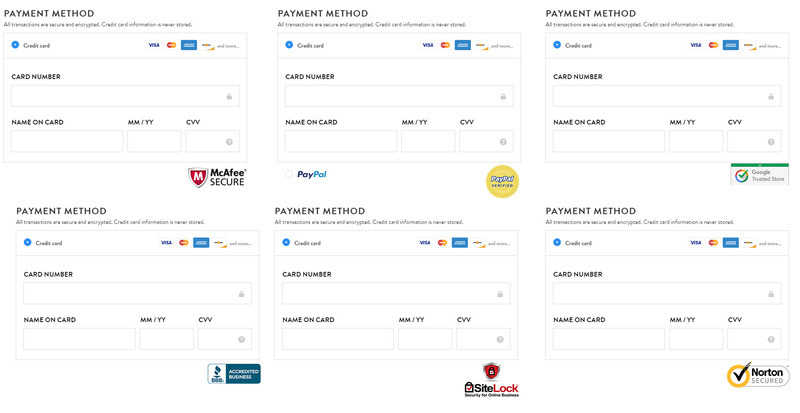 Eye-tracking showed that general patterns of viewing and information processing were the same among all trust badge variants on a credit card form page. The Paypal badge attracted a larger percentage of users than any other badge, and was significantly more than the worst performing in this category, McAfee. There were significant differences among badges in recall rates. Familiar brands (see Trust Seals (Part 1) – Security Vs. 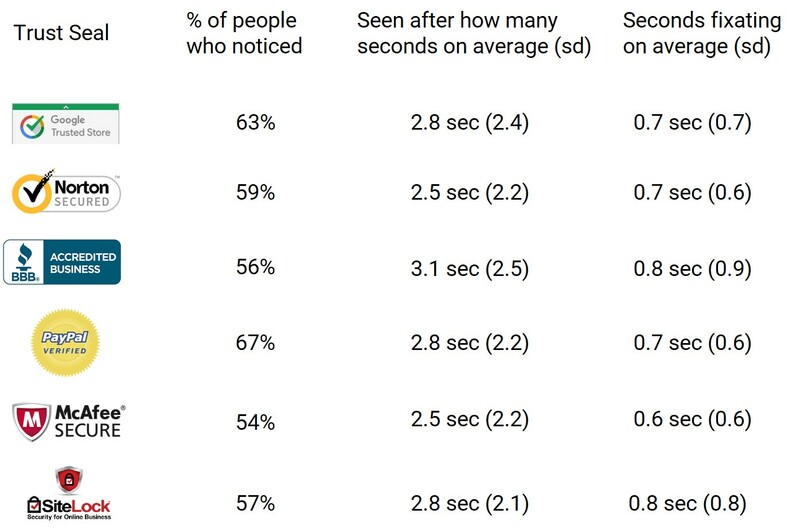 Familiarity) Google, Norton, & Paypal were more likely to be recalled as webpage elements that added to security. Survey your customers. This type of survey is easily executable for your own checkout page, especially without the eye-tracking which didn’t add very much to the takeaways accept for us now knowing that the PayPal badge is visually more attractive (in that it makes more people fixate). If you’re to simply implement, well-recognized brands (Google Trusted Store, Paypal, Norton) are a good bet. Norton would be a good choice if you didn’t want to allow payments via PayPal for some reason and you wanted actual site security practices implemented instead of just associative trust practices. This 2-part study looks at a similar issue as our previously published study on “trust symbol perceptions,” but in a specific part of the shopping experience: the checkout page. 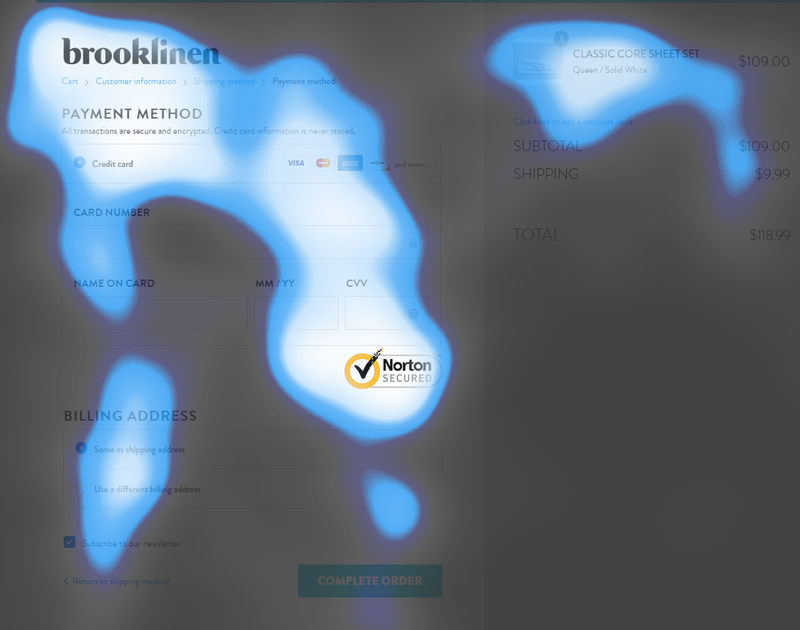 Since the checkout page is where people share sensitive credit card information, it’s an appropriate place to measure feelings of security and trust. In part 1, we study how people view credit card form fields during the checkout process when different trust/security badges are used. In Part 2, we’ll share findings on security perceptions when credit card fields are visually emphasized. 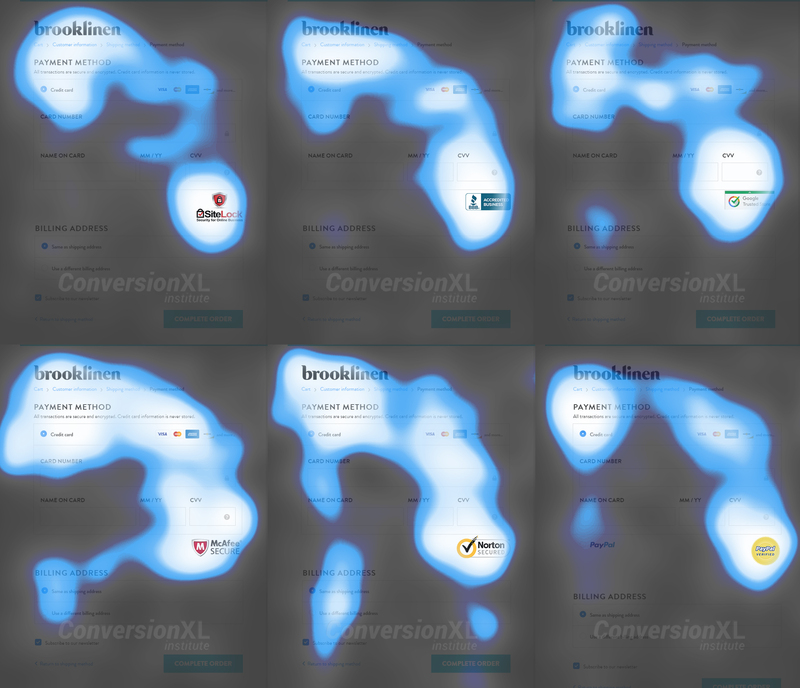 We used eye-tracking to examine and measure user perception of different trust badges. The first question identified the number of people concerned with online security. The next question identified how often, on average, our participants shop online. The last question was open-ended and aimed to identify how many participants considered the trust badge they had seen as a contribution to their online safety. Number of participants used for eye-tracking analysis. Eye-tracking allowed us to compare user behaviors when presented with the different trust seals. Your scenario: You are purchasing nice bed sheets for a friend and are on the checkout page about to fill out your credit card information. Participants then viewed the checkout page with one of the six trust badges for eight seconds. Afterward, they answered the survey questions. Do you ever have security concerns when purchasing online? 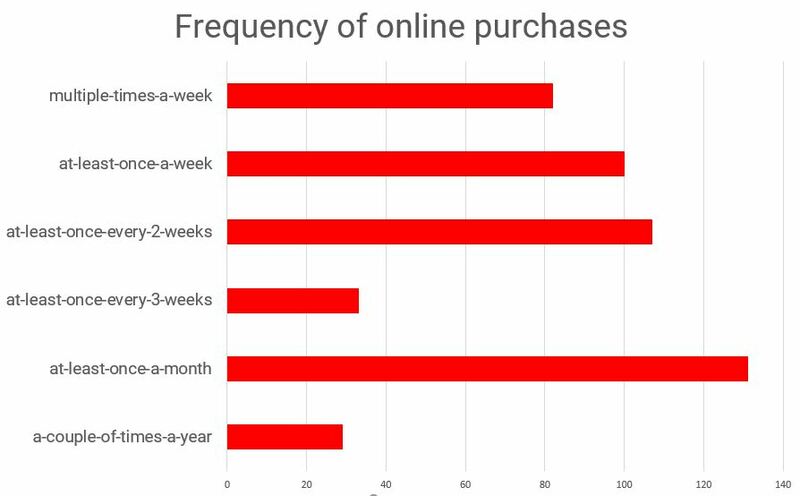 How often do you make online purchases? Were there elements on the form you saw that provided you a sense of security? For each treatment, one trust badge logo was displayed in this location. These maps tell us that all trust badges were pretty noticeable. According to these numbers, it’s clear that there weren’t huge differences between trust seals. Using eye tracking, we confirmed that all trust seals are equally noticeable. However, we did see some differences in the number of people who looked at the Paypal seal. Compared to the McAfee logo which only 54% of participants looked at, the PayPal seal was noticed by 67% of participants. The PayPal seal received significantly more attention than the McAfee seal (comparing the two rates using an N-1 proportion test, p = 0.045). The majority of respondents (62%) reported having security concerns when making online purchases (298 of 482 total respondents). Frequency of online purchases made by respondents. 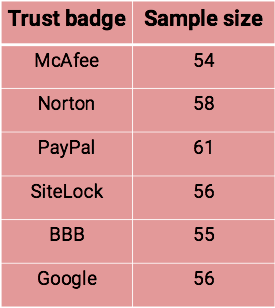 These findings support our research on familiarity vs. security perceptions among trust badges in that well-known logos and brands are remembered more often than their lesser known counterparts. While PayPal’s logo was the most visually attractive, there wasn’t much difference in information processing. First, you should survey your own visitors and go with what is most trusted and recognized. But if you’re just looking to implement, well-recognized brands (Google Trusted Store, Paypal, Norton) are a probably good bet. Part of the summary is confusing. What was the Paypal badge significantly more of? So – is the goal only to look at the eyeballs? Which logo actually drove more purchases? Hey Elise, there’s also the survey component which looks at the working memory part of the information processing, so which seals stood out as more important or not. This data is suggestive and could help test between smaller subsets of seals. What ends up working in some cases won’t in others, but experiments like this can help narrow down the list of possible tests to run. A single A/B test on 1 site between 2 seals is useful/non-useful in different ways.